Real food is raw – minimally-processed, never cooked, all natural nutrition. We believe in feeding raw because we know the good it can do. It’s feeding the way nature intended so your dog is able to absorb and digest all the goodness from whole-food ingredients for: lean, strong muscles, strong bones, healthy skin, coat, teeth and gums, as well as immune and digestive health. 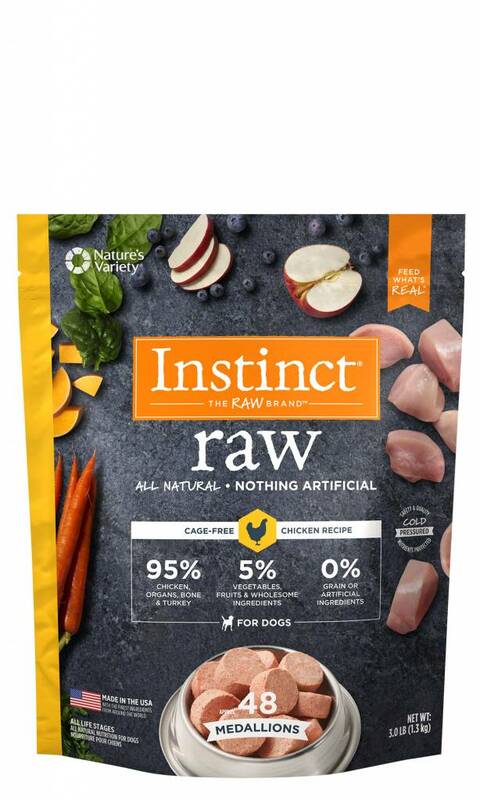 Unlock your dog’s potential to thrive with Instinct Raw Frozen Bites Grain-Free Cage-Free Chicken Recipe. Chicken (including Ground Chicken Bone), Chicken Liver, Turkey Liver, Yeast Culture, Pumpkinseeds, Montmorillonite Clay, Turkey Heart, Apples, Broccoli, Butternut Squash, Salt, Cod Liver Oil, Dried Kelp, Carrots, Spinach, Mixed Tocopherols, Dried Chicory Root, Blueberries, Rosemary Extract.